Jason (the reader) was kind enough to then scan a copy of the paper. Here it is if you wanna check it out (click on the paper on your left to enlarge). Thank you Otto and Jason! This entry was posted on Sun, Nov 16, 2008 at 11:08 pm and is filed under Press, ThinkSimpleNow Update. Email this page. Wow, that’s super cool! I bet you’ll be holding onto that paper for a long time. The Aussies sure seem to love blogging, don’t they? That is pretty awesome – starts with Bill Gates, and closes with you. I am pretty sure this officially makes you the world-renowned expert Tina Su. great to hear tina, what lovely news this article must have been for you. Tina, i miss your articles on thinksimplenow! can’t wait to see some more! Congrats Tina! That’s very awesome. I am an Aussie and I love your site. My favourites are yours and Leo B’s. Great work. Thank you for following your passion, thus lending all your learnings to me. 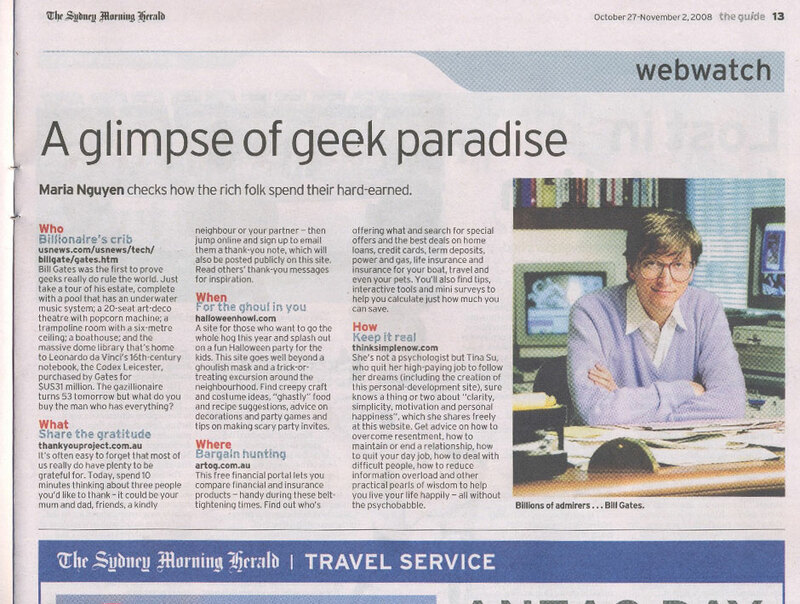 Great work getting in the Sydney Morning Herald. Congratulations ! Great job Tina. You just never know where you will be mentioned next:) Positive vibrations echo through time and space. When you send good energy, it comes back at you in unexpected ways.